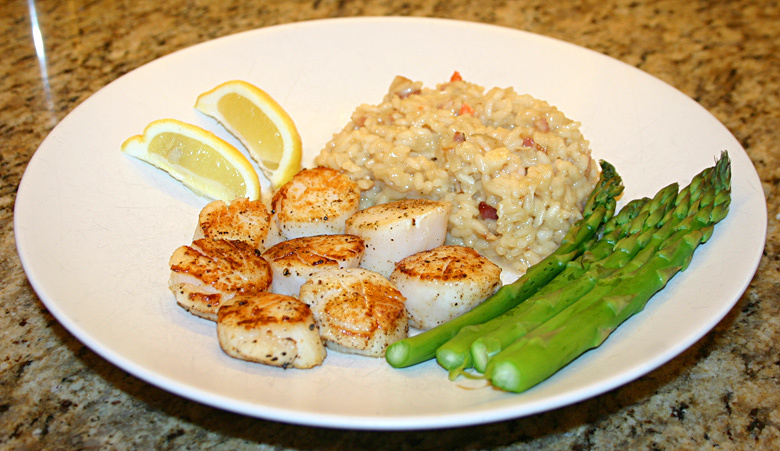 I love scallops and all manner of shellfish, but this post is going to be as much about the risotto as the scallops. We both love risotto, and it works as a side with a lot of different meals. Or you can make it the main dish, add seafood to the risotto, or just serve risotto with a side veggie, vegetarian style. The type of short-grained rice used for risotto (Italian for “rice”) is called Arborio rice, which is also used in paella, another favorite of ours. I’ll post my version of paella next time I get around to making it. 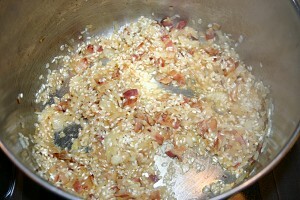 Dice up onions, garlic and bacon for the risotto, and saute up on medium heat in a large pot with butter and olive oil. I mentioned using a butter substitute like Smart Balance in the last Steak Au Poivre post. Using a mix of butter and olive oil instead of 100% butter is another way to make a meal a little bit lower in saturated fat and still taste great. Olive oil can only be used when what you’re cooking is not at a very high heat, though- it has a low smoke point. While the onion, garlic and bacon is cooking, get the scallops ready. 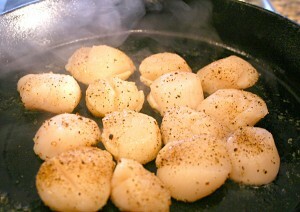 The ideal scallops for getting a proper golden-brown sear are dry-packed, or untreated. 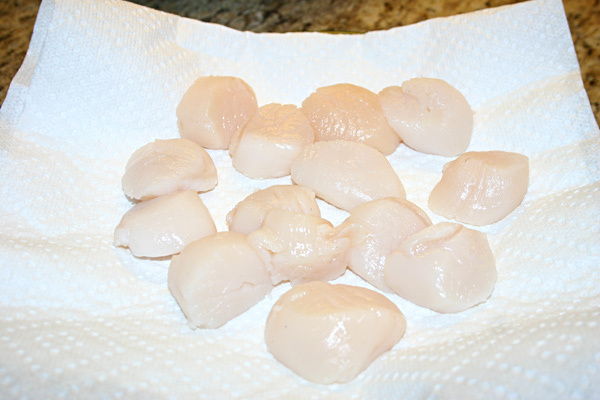 Unfortunately, most scallops you find at grocery stores, or even higher end seafood stores are “wet” versions- treated with sodium tripolyphosphate (STP), which causes the scallops to absorb water and turns them snowy white. Why do scallop sellers do this? According to them, just to make the scallops more attractive. I tried getting dry-packed scallops at the seafood section of a nearby upscale grocery, and the guy told me he doesn’t sell dry-pack scallops because they have a dried-out, unattractive appearance and nobody wants them. Of course I’m sure the fact that treated scallops absorb water and therefore they can make more money per pound has nothing to do with it… in any case, if you can find dry-packed scallops, you have done well. There are online sources for dry-packed scallops. The problem with wet scallops, other than paying extra for the added water, is that when cooking, the scallops will release their water and prevent a good sear. You’ll be boiling, not searing them. But if you can only find the treated kind, all is not lost. The scallops I used here are the wet kind, and as you can see from the final pic I did indeed achieve a proper golden-brown sear. Use paper towels to blot the extra water. I put paper towels above and below the scallops and put a plate on top to squeeze out the water. Then all you need to do is season with fresh-ground pepper and kosher salt on each side. 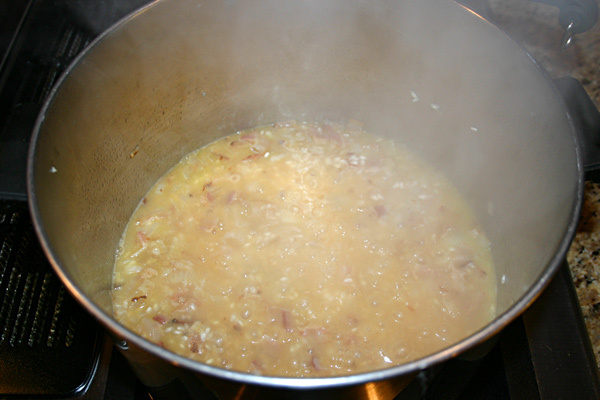 Get the chicken stock in a separate pan and heat it up– it needs to be hot when you add it to the risotto. When the bacon is cooked well and the garlic and onions are translucent, add the Arborio rice and mix it around in the oil for a few minutes, let it get well coated and heated up in the oil. I’m not exactly sure of the chemistry involved, but the hot oil “activates” the starchy shell of those rice grains. Add a little wine to the pan now if you want, and stir it around until the wine reduces somewhat. Now ladle the hot stock into the risotto a little at a time, all the while stirring, stirring. The stirring will break down the starchy shell of those little rice grains and give the risotto the creamy consistency that makes risotto so good. You don’t have to stir constantly- you can do other stuff, but keep going back and stirring, don’t forget about it! As the risotto absorbs the stock keep adding more in. You’ll be able to see when it’s getting done by how the rice grains swell up from absorbing the stock, and by tasting it- it should be “al dente”. What does that mean? it’s a fancy Italian phrase meaning “to the tooth”. What does that mean? Mostly soft but with a little bit of bite to it. When the risotto is almost al dente, put the grated Parmesan or Romano in, mix it around, turn off the heat and cover the pot. it will finish cooking to al dente while you sear up the scallops. Now get out your trusty cast-iron skillet. Like I said in the Steak Au Poivre post, if you don’t have a cast-iron skillet, you really should get one. Nothing gives a good sear on a stove top like a good cast-iron skillet. Get the skillet good and hot first, add butter, and put the scallops on. Leave ‘em alone and let them cook, for 3-4 minutes before flipping them- don’t move them around. At the 3 minute mark try flipping one in the center (usually the hottest spot) and see if it has a good golden brown sear. If so, go ahead and flip the others. 2-3 minutes more on the other side and they’re done. They should be golden brown on top, opaque white on the side, and just a bare hint of translucency in the center when you cut in half. Careful not to overcook or they’ll be tough and rubbery. Serve with a couple lemon wedges and your favorite side veggie, and enjoy!